Join the discussion on our forums! Come discuss Spirit of the Dead over in our dedicated Spirit of the Dead discussion topic. Stealth for 1 turn. After a friendly minion dies, shuffle a 1-Cost copy of it into your deck. 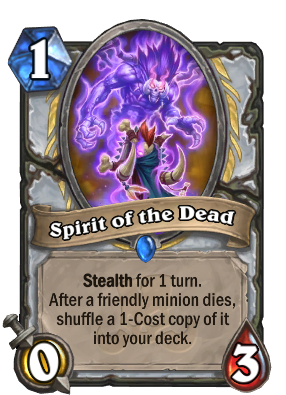 Dude, playing cloning gallery pulls out Spirit of the Dead with it, if they board clear you get all of your minions back into your deck for 1 and can draw them with Bwonsamdi, the Dead. That by itself is VERY strong. Princess Talanji could not only be used with that combo, but also by itself with Seance. I am hyped! Dude, when playing cloning gallery and it pulls out Spirit of the Dead with it, if they board clear you get Nothing, because you spirits are death too! Seems to gimmicky to me... I dunno. The combo seems cool but very unreliable. Spirit of the Dead on board into Zerek's Cloning Gallery with what, Wild Pyromancer to kill them all? Or hope your opponent does. Then you draw them with Bwonsamdi, the Dead and play Princess Talanji to cheat them out? Too much work..
You don't need to cheat them out with Princess Talanji—they all cost 1 mana. It's actually more expensive to play her. I feel like people are just too focussed on getting a combo out of this. What's the problem with just playing it for value? Take something like Elise, Trailblazer, any decent deathrattle minion or the occasional Amara. You can just run one copy of this alongside Bwonsamdi, who is good enough on his own with Priests regular 1-drops. Neat card for a cloning lab value combo, still...not that great. Maybe synergy with the Test Subject/Boar deck. Whenever the Test Subject dies you will have your spells back and another subject in the deck. I think it will not work because the echo adds the card with its real cost to your hand - i.e. the first Militia will cost 1 but the next (i.e. the echo) will cost 3 mana. "Echoed copies are always the original version of the card." Well, at least if you shuffle 1 cost Militia then you can play 4 Militias for 10 mana which is 4 taunts and 8/16 in stats - not so bad. The problem is that the three main priest board clears atm, Duskbreaker, Psychic Scream and Circle of Healing+Auchenai Soulpriest, have anti-synergy with this card. Well, you can kill Velen for 10 mana (i.e. no need for Coin) by play the Spirit (1) + Velen (7) + Holy Smite (1) + Holy Smite (1). The hard part of combo'ing with Bwonsamdi, the Dead willl be drawing Bwonsamdi, the Dead before you flood your deck with so many one cost minions that you never draw him before your portrait explodes. Don't need to be complicated with combos. Just use this and kill 1 or 2 minions it's already value town. Maybe with tempo oriented meta season after season im too pessimistic (as a priest main) but I honestly dont see how this kind of deck, even how potentially broken it may seem can live in the same meta that also have Odd Pally, Zoolock and Token Druid. Then there are older archetypes that are getting more love, like quest mage getting closer to a comeback, I know its not there but yet.. I just feel this expansion will be just another: Oh look how many cool decks you could play if we cared two bits about balance. Potentially every expansion pretty much since KOTFT have had cards that suggested options for new archetypes that could never live up the expectation. Hearthstone is becoming blander and blander as a result and you see this with streamers jumping the ship to other more interactive and fun card games.